Cairo, Asharq Al-Awsat—As Tunis prepares to host a security meeting of foreign ministers from the six countries neighboring Libya, Asharq Al-Awsat spoke to the Arab League’s special envoy to Libya, Nasser Al-Kidwa, about the ongoing political turmoil and security crisis in the country. Kidwa, a former Palestinian foreign minister, was appointed Arab League special envoy to Libya in May earlier this year. He has called for greater coordination between regional and international parties to resolve the ongoing crisis in the country, where controversy has beset the relationship between Libya’s parliament, the General National Congress (GNC), and the Abdallah Al-Thinni government, with many Libyan lawmakers preferring Ahmed Maiteeq, whose election was overruled by the country’s top court. At the same time, rogue general Khalifa Haftar has launched military operations against Islamist militias in Benghazi, announcing a military coup against the Tripoli government. Amid this state of political and security uncertainty, Libya has witnessed a state of increased lawlessness and displacement, raising fears among neighboring states. Asharq Al-Awsat: What was the purpose of your recent visit to Libya? Nasser Al-Kidwa: This was a normal visit to Libya to listen to the concerns of the Libyan people and it should have taken place before now. Regrettably, the visit was delayed due to certain circumstances and the view of some Libyan officials that it should be postponed altogether. This is logical, particularly as Libya is awaiting the formation of a government—and then there were the preparations for the elections. Therefore, it was natural for this visit to be delayed because you cannot deal with Libya’s issues without, first and foremost, listening to all relevant parties in the country. Q: Libyan Foreign Minister Mohamed Abdulaziz has spoken about the existence of dialogue and reconciliation efforts between the warring parties. Are you seeking to promote a more comprehensive reconciliation process? The main aim of my visit to Libya was to listen to the Libyans and determine whether they want this kind of help or not; and if they do not want outside help or support, we must respect that. We as the Arab League are prepared to provide the support and help as needed—and as Libyans see fit. After that, we also need to talk about how to provide this support and help. Q: Libya’s state institutions are weak and fragile, particularly due to the security situation in a country where arms are prevalent. Is the Arab League working with the United Nations or the African Union to reduce the state of tensions on the ground? It is very difficult for any party—whether we are talking about the UN mission, the African Union representative, or myself as the Arab League envoy—to deal with the security tension on the ground in Libya and present solutions to the crisis. However, political dialogue opens horizons and dialogue between neighboring states that could help provide support to deal with the deteriorating security problems. Only then can we build a vision [to solve the crisis] which must be the result of the different Libyan views, in cooperation with Arab parties. This issue certainly requires coordination with the UN and the African Union. Q: Are there any plans to hold an international summit—one including Arab, African and Western states and organizations—on the situation in Libya, in order to reach a unified position on how to solve the crisis there? We are totally open to any coordination and welcome all efforts. It is Libya’s decision as to who they want to cooperate with, but as far as the Arab League is concerned, we are prepared to cooperate with everyone. 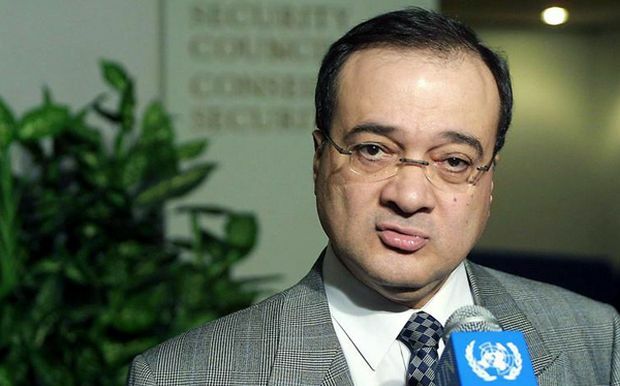 Q: Your UN counterpart Tarek Mitri has also been working on resolving the Libya crisis without achieving any result. Who should take the lead in resolving this issue? The UN is one of the key players in Libya, by virtue of its work and the mandate from the Security Council. However, I believe that the Arab League, along with Arab states, could be the key to the solution. I think Arab efforts to solve this would be more acceptable to the Libyan people. I think the world, as a whole, is waiting to see what the Arabs will do and the extent of their success in this regard. Q: US Secretary of State John Kerry has also stated his support for your mission in Libya . . . The Arab role in Libya is very important, but the main issue remains in the hands of the Libyan people. Q: In your view, what is the main reason behind this continuing crisis in Libya, and who is responsible? The problem is caused by a number of reasons, chiefly the former regime which left the country with no institutions. The Gaddafi regime left Libya divided, spreading conflict among various sectors of the Libyan people. There is always difficulty in rebuilding and changing, whether in Libya or elsewhere, after revolutions and the fall of former regimes. As such, the issue of rebuilding is a difficult one. Q: Do you think any foreign parties are responsible for escalating the conflict—if so, what does the Arab League intend to do about this? Part of our mission is to talk to all parties, especially in Libya and the wider Arab world, not to mention the rest of the international community. We believe that the Arab parties are the most important ones in this regard. I have already visited Qatar and the United Arab Emirates to discuss the situation in Libya and intend to conduct more foreign visits to discuss this important issue. Q: What was the outcome of your meeting with the Libyan foreign minister? Did you agree on any specific steps? There is good coordination between the Arab League and the Libyan Foreign Ministry. A number of Libya’s neighboring countries are set to meet on July 13 and 14 in Tunis, which will provide another opportunity for more consultations. This security meeting will include the foreign ministers of Tunisia, Libya, Algeria, Egypt, Sudan, Chad and Niger, and representatives of the Arab League and the African Union will also attend. This meeting will discuss current developments in Libya and the type of support which could be provided by the neighboring states to establish national dialogue in Libya and achieve transitional justice. It will also discuss the support for the country’s institutions and the course of democratic transition in a safe and secure manner. Therefore, we need to reach a consensus view and find a way to emerge from the current situation to a new democratic Libya which preserves the rights of the people on the basis of equal citizenship. Q: What about the role of Libya’s tribes—are you in contact with them? And how will you address the issue of armed Islamist groups and the fears regarding terrorism in the country? I acknowledge that there are a number of problems in Libya. There are many armed groups and regardless of what role they played during the revolution, the presence of so many militias is a problem. State institutions, especially security institutions, are very important. There is also the issue of Libya’s tribal structure and the role which tribes play in society at large. They are an important part of Libyan society, and it is certain that we will have dialogue with them. They must be part of the solution in Libya. There is also a third issue, which is the terrorism that threatens Libya, the neighboring states, and the entire region. This is a problem of a different nature and the strategy for addressing it must be different from the strategy employed to solve Libya’s other problems. Libya needs national dialogue, a consensus vision to allow the formation of a transitional road map, as well as addressing the security issue. As for the security question, this requires a different approach. This cannot be our task, but the task of the Libyan parties themselves. Q: What about the issue of the Libyan diaspora, with many Libyan nationals fleeing the country following the fall of the Gaddafi regime and the subsequent outbreak of violence—how should Tripoli address this issue? My personal view is that anyone who was not associated with the old regime and was not involved in crimes against the Libyan people, as well as anyone who was not convicted in a court of law, should be allowed to participate in the new Libya with all their potential. How that happens exactly is a Libyan affair, but if they ask the Arab League for advice, we will give it. Therefore, the issue of reconciliation and transitional justice is important, including uncovering the truth and holding those responsible to account. This interview was originally conducted in Arabic.